With over 2,000 closure procedures and laser treatments. 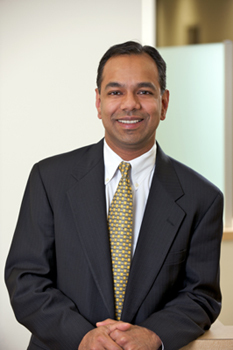 Dr. Arun Goyal is a pioneer in the field of minimally invasive treatment of varicose veins. The closure procedure is a minimally invasive procedure done under local anesthesia and has replaced the vein stripping and ligation surgery which was common in the past. Dr. Goyal is the director of Atrium Laser Vein Center, which can claim one of the largest experiences in the United States in the treatment of varicose veins. Dr. Arun Goyal is board-certified in general and vascular surgery and is a leader in the field of venous disease. He earned his medical degree at New York Medical College in 1990. He then spent five years at an accredited general surgery training program at Mount Sinai Hospital, New York. Afterwards, he did fellowship training in vascular surgery, also at Mount Sinai Hospital, New York. Dr. Goyal joined the vascular practice of Dr. Sateesh Babu and Dr. Pravin Shah in 1996 and is currently assistant professor of surgery at New York Medical College. Dr. Goyal is a fellow of the American College of Surgeons and is a member of member of the American College of Phlebology. He is active in the field of venous disease and has presented his results at national conferences.